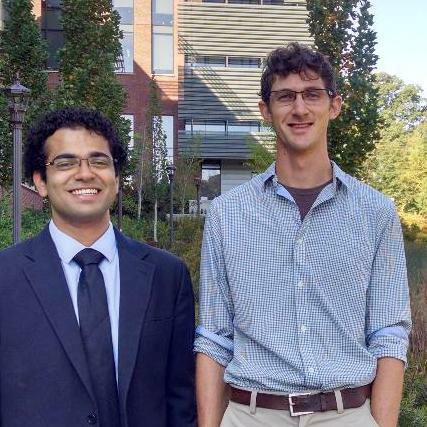 Congratulations to Shashwat Nagar (MS) and Will Overholt (PhD), who were recognized as the 2017 Outstanding Students in Bioinformatics at Georgia Tech! Each student received a cash award funded by the J. Leland Jackson Endowed Fellowships Fund in Bioinformatics. Both students were selected for demonstrated excellence in their academic studies and their Bioinformatics research. Will Overholt, our outstanding PhD student, is in his 5th year of study, planning to finish his doctoral degree in May 2018. His advisor is Professor Joel Kostka. During his tenure at Georgia Tech, he has published three first author manuscripts and co-authored an additional five manuscripts, along with a book chapter detailing amplicon based analyses of microbial communities, focusing on statistical and bioinformatic methodologies. He will have a fourth first author manuscript submitted by early fall and aims for a fifth by the end of the fall semester. The majority of Will’s research has leveraged Georgia Tech’s high performance cluster environment. As one example, this has enabled him to construct predictive models about the biogeography of deep marine benthic microbial communities across the Gulf of Mexico and identify areas impacted by the Deepwater Horizon oil spill which occurred in 2010. In addition to the peer-reviewed manuscripts, Will has presented his research at 18 conferences ranging from regional to international levels. Twice he was awarded best oral presentation, and he has given talks at two international conferences. He was also on the organizing committee for the Southeastern Biogeochemistry Symposium and was just elected co-chair to the Gordon Research Symposium for Applied and Environmental Microbiology. While Will ultimately plans to apply for faculty positions within the USA, he looks forward to joining a research group within the EU for a postdoctoral position to broaden his collaborative networks and experience science from within a different culture. He has focused on groups with great expertise in microbial physiology and biogeochemistry, to complement his bioinformatics experience gained at Georgia Tech. The Bioinformatics award selection committee calls Will, “One of the brightest and most talented young scientists in recent years, who has already published multiple significant papers. A clear standout.” Will has recently accepted a postdoc position at Friedrich Schiller University in Jena, Germany. Shashwat Nagar, our outstanding MS student, maintains a perfect 4.0 GPA while taking challenging elective courses like Data and Visual Analytics and Biostatistics. He was heavily involved with planning and execution of several student-side projects for the course BIOL7200 - Computational Genomics - where students worked with data directly obtained from the CDC. Shashwat has worked with Professor King Jordan since entering the MS Bioinformatics program in fall 2016. His most recent project explored pre-Columbian cryptic African ancestry in Native American populations - a project aimed at agnostically analyzing popular conspiracy theories about pre-Columbian African contact in present-day Latin America from a genomics standpoint. Shashwat also student completed a summer Internship at the Mayo Clinic in Rochester, MN. There, he worked on a mobile pharmacogenomics delivery system that enables patients to receive personalized medication recommendations even when they leave the Mayo Healthcare system.